Health Barn Clinic - Award Winners! News Article - The Health Barn Clinic wins coveted award! The Directors at the London & Thames Today publication were so impressed with the exceptionally high level of customer-focused care given that they voted overwhelmingly in favour of selecting The Health Barn Clinic as recipients of the Award for Alternative Medical Services in Healthcare..
Recognised both locally and nationally, this Award is not necessarily given to the largest firm within the sector but rather the criteria is that the recipient has shown a desire to recognise best practice as well as demonstrating a philosophy of placing the client's well being top of its' priorities. The Health Barn Clinic was established in 1972, by the late Nigel Vukovich, the renowned Homeopath and Osteopath. Over the years it has earned an excellent reputation and is very highly respected as a Natural Therapy Centre. The clinic prides itself in stocking a vast selection of very high quality vitamins, minerals, herbal remedies and nutritional supplements. Dr. Dan Manu MD, LCPH, Dip HTOX, MARH, MSHAT is the resident Homeopath and is conversant with all conventional medication but practices at the clinic as a Homeopath/Naturopath. 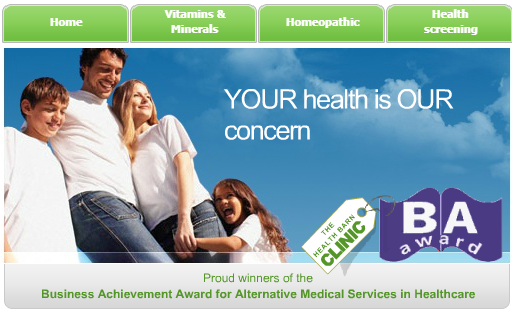 His field of expertise encompasses not only Nutritional Supplements but also Homeopathic and Herbal remedies too. Dr. Manu deals with an extremely wide range of health problems from Hormonal Imbalance to Skin Problems and speaks fluently in English, French, Spanish, Portuguese, Italian and Romanian. Commenting on receiving the Award, Alex Vukovich said: "I am thrilled that the Clinic has been selected to receive this prestigious award". "I would like to give the credit to my late father, who worked tirelessly to establish the Clinic's reputation." He concluded: "It is my sincere desire to build on my father achievements and maintain the highest level of natural health care for our patients. To help accurately assess your health requirements the clinic has the latest CoRe Inergetix advanced Diagnostic System, the latest technology of this kind from Germany Where it has been thoroughly clinically proven and tested. Having been used in the private sector for a number of Years now, the system is connected to the body non invasively, Similar to the way an Electro Cardiogram monitor would be connected in a hospital. The process is based on Quantum Physics which is able to accurately diagnose up to 30,000 body elements in health or disease via the bodies bio energetic fields. The evaluation takes approximately one hour with the resident Homeopath/Naturopath Dr. Manu. The Health Barn Clinic also has an excellent reputation for treating back problems and muscular, joint discomfort. The Clinic has a Chiropractic Doctor and a resident Sports Therapist, together with a Psychologist and Acupuncturist. Easily accessed via the M1, M10 or M25 without having to enter St. Albans Town Centre, The Clinic provides clients with ample unrestricted parking outside the premises. Having been singled out to receive this accolade serves as a distinguishing factor that ranks The Health Barn Clinic amongst the best in its field and acts as a benchmark as to the high level of quality and professionalism clients may expect from this forward thinking company.